On Memorial Day we think of those that served in the Armed Forces and died for the freedom that all of us in the United States enjoy today. But there are others that fought for freedom and an equal right to vote who also lost their lives. These “freedoms” did not exist in the South before 1965. Thinking about the influence of family and role models inspired me to “finally” publish a post that I’ve been working on for a while called “Selma and the Transformation of a Segregationist”. My father’s second cousin was Gov LeRoy Collins of Florida. Gov Collins was Florida’s 15th governor but he is probably best known for his stance on Civil Rights during a period of great racial unrest in the South during the 60s. Given the riots that we are witnessing from Ferguson to Baltimore, I began to read about Selma and the courageous stance that was taken by many Americans and those that died fighting for civil rights. We’ve been back in the States now for a week and a lot of people have asked what my biggest takeaways were from being on the road, with my family for 5-weeks. For Americans, a 5-week holiday is a lifetime. I remember talking to a young couple from Holland who were on an eco-bike tour with us. When I told them we were from the U.S. and on a 5-week holiday the wife said, “That’s very odd for an American”. I am thankful to many people for allowing me, my wife and kids to experience 5-weeks in Southeast Asia. The support I received from my company to allow this to happen was incredible and I want to thank everyone at My-Villages for covering for me. My wife is going through hundreds of photos and videos. We will publish them on Shutterfly soon. You can read the full article on “What I learned in Bali” here. We stayed in Ubud for 2-weeks and while planning the trip one of things that I wanted to do was a take a side trip to Lombok, the island just east of Bali. However we had limited time and we wanted to simply get a feel for the island life. A couple of friends recommended that we visit Gili Air, the smallest of the three islands northwest of Lombok. “Air” means “water” in Balinese. There are a couple of good posts on what to do in the Gili Islands. But if you only had two days and one night is it really worth going? If you want a place to completely get away from the congested traffic, motorbikes and crowds of tourists in places like Ubud, Seminyak and Kuta during the summer; the Gilis are a good respite. But you really need more than just two days to allow yourself to unwind and enjoy some of the things the islands have to offer like cruising, diving, surfing and fishing. Gili Air doesn’t permit gas powered motorized vehicles on their tiny roads. To get around you either walk, bike or a hire a donkey drawn wagon. Once you realize how small the island is you realize that the wagons are more of a tourist draw than anything but they are great for photos and for the share “check list” factor. One of my favorite things about the Gilis are the colorful “spider” boats found through both Bali and Lombok. 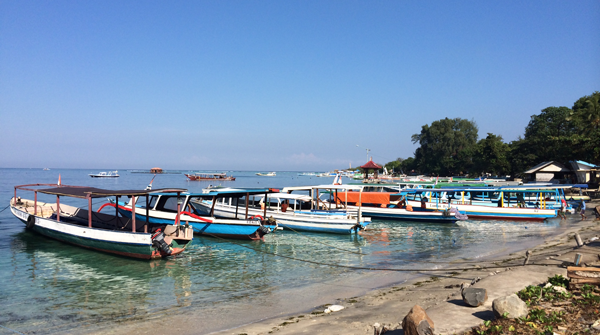 But due to it’s tiny size, the colorful boats of Gili Air are especially spectacular. We didn’t have time to hire one but we did swim around them as we shared the shallow reef while snorkeling with a number of tourist dive boats. The snorkeling right off of the beach in Gili Air, especially behind and to the east of Smugglers Beach Club Cafe provides for some great diving that is easily accessible at depths of 3-5 meters. We witnessed a good selection South Pacific marine life. Interestingly we met a volunteers at the California , we were able to catch a glimpse of this ecosystem with our own two eyes. We stayed at Smugglers Hideaway, which is made up of a small collection of motel rooms and a nice pool. While not right on the beach, it was a short walk from the beach and easily accessible to the beachfront cafes, bars and dive shops. “Easily” means 15 minutes that once you leave the Hideaway takes you between a couple of homesteads. Interestingly, Buddhist chanting could be heard through the night over a loudspeaker that apparently was being emitted from the , seemingly random. The statue to the left symbolized our state of mind in Gili Air. It’s a popular figure as we’ve seen variations of it throughout Bali but the rustic, sleepy and tranquil nature of Gili Air is embodied in the sleeping man. We have been in Ubud, Bali for 10-days but you quickly lose count of what day it is our how long you’ve been here once you let go and get immersed in the pace and energy that is “Ubud”. The travel journals will say that Ubud is the “art and cultural” center of Bali. I would have to agree that the culture here is intoxicating. What surprised me personally is how long it took me to immerse myself in it. I had a much harder time letting go of the stress I brought from home than I thought. But a handful of massages from Soni at Juuk Manis Reflexology and a couple of Vinyasa Flow classes at the Yoga Barn, and my attitude adjustment finally kicked in. Other than the Gili’s, as of this writing I haven’t spent much time anywhere else in Bali. Next week we are going to Sanur and Seminyak. But for now we are immersing ourselves in the food, massage, yoga and spirit that is Ubud. Ubud has a wide array of restaurants, cafes and warungs (small family-owned shops). I love the Balinese food with its variety of spices, rice, noodles and choice of protein. Nancy and my daughter took a Balinese cooking class at Bumbu Bali that included a trip to an authentic Ubud market. They both came back to the villa with a cookbook that included a number of Balinese recipes so we can enjoy these dishes at home. There are numerous Asian, Mediterranean, Italian, French and American style eating establishments as well. We enjoyed Terrazzo, a small bistro very close to our villa where we found Mojitos along with both Balinese and contemporary Italian-influenced dishes. Last night we enjoyed pumpkin stuffed raviolis, carpaccio and fresh seared Ahi tuna with a pesto spread on top. The Ahi tuna was $9.00 which was about 1/2 to 1/3 of what it would have been at an upscale restaurant in the States. On the flipside, wine and liquor is expensive by American standards so be prepared to pay a premium. The local beer, Bintang, has a monopoly in Bali and is two-thirds the price of imported beers. Nancy took a liking to San Miguel Light which on average costs about $2.50 per bottle. While Ubud exudes “peace”, the streets are far from “peaceful”. You have to get off of the main road (Jalan Raya) and make your way to the gardens, jungles and numerous walks through rice paddy fields to enjoy all the beauty that Bali has to offer. We chose a villa that is inaccessible by car. The only way to get to the villa is on foot or by a motorbike. So while we were within a 15-minute walk from the busy “Main Road” and Monkey Forest Road where most of the shops and cafes are located, we were removed from all of the noise and commotion of the traffic and tourists. Our villa is situated in a rice paddy called Juwuk Manis which is Balinese for “Sweet Orange”. It is during these walks through the rice paddy that you can discover the peace and tranquility that the interior of Bali is known for. Ubud is laid out in such a way that rice paddies are incorporated and preserved in the midst of urbanization. There seems to be a conscious effort to preserve green space. This is likely due to the fact that foreigners cannot own land in Bali and much of the land is owned by Balinese farmers. Foreigners typically lease plots of land on a 30-year term and build villas, resorts, etc. Foreigners can buy land through an intermediary but they can not legally hold the title to the land. In these cases the purchaser will often do a 60-year lease just in case the government decides to can the whole concept of intermediary ownership. View from our porch overlooking the rice paddy. You hear the constant banter of roosters, birds, and ducks feeding on rice in the fields along with strategically placed wind chimes and the occasional motorbike passing by our villa. The rice paddies are active and they are worked daily (sunup to sundown) by rice farmers. Rice farmers create small huts where they store supplies and use as a retreat from the sun. They will often stay in these huts overnight. In the midst of the active rice paddies, new villas are being built as well. Developers typically select builders and laborers from nearby Java because of their work ethic. The Java workers will also build huts that they will live in until the construction project is completed. Rice paddy hut near our villa. There are a number of posts on the process of cultivating rice in Bali, so I won’t get into the details here but basically rice is harvested four times per year if its hybrid rice and twice per year if its organic. The primary reason for growing rice in Bali is to feed the Balinese people. The rice is only sold on the open market if there is a surplus. But as an engineer, I am fascinated by the hand carved aqueducts and irrigation system used to flow and then drain the fields. Once the rice is harvested ducks are used to eat the last bit of rice in the field. Then the fields are tilled, new rice is planted and then the flooding process begins. We were told that most of the water comes from a single source, the deep cratered Lake Batur which lies in between Mount Batur and Mount Agung. The water flows over 50km from this lake into the aqueduct system throughout Ubud. When we first started looking into flights from the States to Bali, we noticed that many of the airlines allowed you to book multi-day layovers in their hub cities. I call these “stay overs” as utilizing this option allows trans-Pacific travelers to catch-up on jet lag and to visit a place that you may have never been before. We booked the Le Meridien for four nights (one before we arrive) because our flight landed at 6am. This would give us three whole days to spend in Hong Kong. But when we missed our flight out of SFO that pushed everything back 24-hours giving us only 2-days in Hong Kong. As we read and talked to people about Hong Kong, a couple of different themes kept coming up. Aside from it being the financial and business center of Asia, Hong Kong is known as one of the most delicious cities in the world. You can find an unbelieveable bowl of noodles with your choice of protein for until $3.00 (which we did) or you can spend upwards of $2,000 on seafood delicacies (which we did not!). The other theme we latched onto was the idea that you can buy quality stuff cheap in Hong Kong. I am sure this is true but the gravitational force of finding “a deal” on the other side of planet turned into an effort in futility and to my disappointment we missed out on some of the rich cultural amenities Hong Kong has to offer. One of the things my wife wanted to do was have some palazzo pants made for her and my daughter. We found a really nice pair in San Francisco that my daughter wanted but my wife told her that we can surely get five pair made in Hong Kong for the price that we would pay in San Francisco. The hotel concierge gave tips on which markets to go to and where the most reputable tailors could be found. One was the Lord’s Tailor near the Central Station on the main Hong Kong island. This was our destination until we asked the fateful question “what market can we go to to find the real deals?” We were then directed to Mong Kok district. On the map it showed bazaars featuring electronics, womens clothes, mens clothes, sporting goods. “That’s the place for us” we thought. Getting there was the fun part. We traveled by taxi to the Star Ferry building on the northern tip of Hong Kong Island and then we traveled by ferry to Tsim Sha Tsui. Using the Star Ferry was the only thing we did that made the Time “Hong Kong: 10 things to do” list. Here you will find find people from all over the world who have come to take in Hong Kong’s energy. The skyline view of central Hong Kong from the harbor is a popular place for tourist to snap memories. The Clock Tower sits in the center of the Tsim Sha Tsui square. There are a number of cultural attractions here that are probably well worth seeing like the Hong Kong Museum of Art and the Cultural Center. We did go to the Hong Kong Space Museum and if you have ever been to a space museum in the States do not waste your time going here. We live in Florida and our kids grew up going to the NASA Kennedy Space Station, so we really should have known. But after dragging our son aimlessly through bazaars in Mong Kok, it was the only thing he wanted to do. We traveled from Tsim Sha Tsui to Mong Kok by subway. This was a fun experience for us. Keep in mind that since Hong Kong was a British colony for so many years that most of the signs are in both Chinese (de facto Cantonese) and English. My kids have only been to NYC once, so I wanted them to experience this. When we emerged from the station everyone was hungry so we found our way to a “food court” type environment and quickly noticed that we were the only tourists. We spotted a place called Viet’s Choice serving a number of Vietnamese dishes including one of my favorites, fish cake noodle soup. We knew we were in the right place when the waitresses (who could not speak a word of English) were fighting over who would be forced to wait on us. We pointed at menu items and made some rudimentary hand gestures to get our order across. It was a big oversight on our part not learning some basic Chinese. Everywhere I have traveled, people really appreciate it when tourists at least attempt to speak the native tongue. After a day running around the streets of Hong Kong it was great to make our way back to Le Meridien Cyberport. We had first class service and food at this hotel, and getting the Starwood Prefered Guest upgrade was a great added bonus. In my Mini-Retirement post I talk about how we accumulated enough points to get both the upgrade a free hotel stay. San Francisco was the first stop on a 5-week mini-retirement with my wife and 2-kids (13 and 10). For our San Francisco portion, we based most of our activities around a useful article in Time called “San Francisco: 10 Things To Do”. I’ve been to San Francisco many times. At one point in my career I was going 5 times per year. But this was my first time as a tourist and surprisingly I was at a loss for what to do, where to go. We had good friends that had a just spent 3-days there who followed the Time article suggestions and loved it so we had things pretty well mapped out. This itinerary worked out really well for both the kids and us adults. Of course that depends upon budget and personal preference but we stayed in the tourist district near the wharf. There are far more posh or hip places to stay. If you want the hippie and Bohemian cultural scene stay near Haight Street (e.g. Metro Hotel or Stanyan Park Hotel). For the luxury hotels there’s the Ritz, Four Seasons and Marriott Marquis clustered between Market and Mission Streets. But if you don’t mind being among 1,000s of tourists, the hotels between Pier 39 and Fisherman’s Wharf are great if you have kids. We stayed at The Argonaut, a boutique hotel on Jefferson Street near Scoma’s. It’s slightly out of the main Pier 39 tourist mayhem but a close walk to it if you want to view the sea lions and loads of various street performers. This hotel isn’t cheap. The average rate being in the $450/night range. In a future post I talk about a hyper credit card point accumulation hack we used to make it affordable. For starters the weather was perfect. The high was 65 and the day perfectly clear. We decided to make this our foot exploration day. We walked up Columbus to the backside of the Telegraph Hill steps. If you take the steps coming from Embarcadero you are faced with 400 steps to climb. I am one of these nutty stair climbing types so I was excited about the challenge but my kids not so much. So instead we walked up the backside of Telegraph Hill from Greenwich Street which is about a 250-step climb. When we got to the Coit Tower the only way to the top was using the elevator and the lines were long, so we bailed and meandered around the park before making our way to the train stop on Embarcadero. At $2 per person, the San Francisco public transit system is still the best value in America and the train operator was actually courteous. We took the F-Line up Market Street and got off near Haight Street. From there we walked up Haight Street to the Golden Gate park. Note that this is a pretty long, over 20 blocks from Market Street to the park. But if you are up for it you will walk through some of the most eclectic neighborhoods in America. My kids saw things and people they never had witnessed before. My personal destination was Amoeba Records near Haight and Ashbury. But my kids and wife really weren’t into it as they were tired and hungry. I could have spent 3-hours there. I talked to an employee who had worked there for 25-years. I excitedly told him about my collection of old records that I that I just knew they were worth a fortune now. I told him about my Rolling Stones “Some Girls” album with all the faces on the cover prior to them being blocked out by the threat of lawsuits and my Public Image Limited (PIL) “tin can” album. He nodded having heard this story hundreds of times before and finally said “those are cool, but they printed millions of those albums when they first came out”. We ate at Cha Cha Cha (recommended by the guys at Amoeba) and if you like Cuban food and are in this area you can’t beat it. Great margaritas and ample portions that will satisfy any weary traveler. We then walked into Golden Gate park to be greeted by a couple of guys that looked like they lived in the park getting into it with some young, brazen tourists. We walked through the gardens and then made our way to our final destination, the California Academy of Sciences (CAS) planetarium and aquarium. This was definitely worth the trip. If you go, the must see exhibits are the planetarium, the living rainforest and the aquarium. The planetarium show was top notch and we learned all any non-physicist would want to know about dark matter. The aquarium too is world class. We talked to a couple of the volunteers there and learned pretty quickly that they are proud of their aquarium as they’ve replicated a deep (50 foot) living coral reef similar to those found in the south pacific. To keep the water warm in the San Francisco chill, they have huge stadium lights affixed to suspension cables propped just above the water line. The aquarium is visible at three different levels. After climbing to many different levels of the rainforest we checked out their sustainable roof that is alive with plants and solar panels that power the majority of the building. To top it off we took an Uber Town Car back to the holte. We used Uber as much as possible in SF. This is a must do tourist activity when the weather is accommodating and we had perfect weather as the photos below show. We were told that San Francisco has on average 70 clear days per year and this was one of them. The Argonaut makes bikes available to their guests for free on a first come first serve basis. They had two left so we rented a tandem bike from Blazing Saddles. I want to give Blazing Saddles a quick shout out because they’ve got two things down. 1) They have an efficient process for getting customers signed up, trained on the rules of the road and then outfitted on a bike. The owners or managers must have experience in the fast food industry or something. 2). Each of the staff members we dealt with had a super attitude and upbeat personality. When are bike trip was over my wife and I enjoyed a couple of beers at the Blue Mermaid and then ventured out with the kids to Pier 39. We did the proverbial Sea Lion watch which is what it is but for me the more interesting thing was seeing the variety of talent performing on the street. Jugglers, musicians, break dancers, rappers, you’ve got it all right there in that 5 block stretch. We stumbled across a band from Portland, OR called All The Apparatus. They were playing a gig that night somewhere and decided to bang out 45 minutes of music to promote their show. My wife and I were standing next to the manager of the Blue Mermaid and she said “this is one of the best acts we’ve seen here in a long time”. We actually went to Chinatown the following day. This is where my suggested itinerary diverges from what a family of four could reasonably take in given 2-days is all you have to spend in San Francisco. Instead of having dinner in Chinatown, my wife and I were invited to have dinner at the St. Francis Yacht Club with a client of mine and his wife. The views are absolutely over the top. If you are biking the bridge you go near the club so check out the views yourself. (As a side note: the kids stayed at the hotel and we ordered them Tony’s Pizza delivered to the hotel). We didn’t have much time on the third day because we had to pack and prepare for our flight to Hong Kong. However we did hop the cable car up Columbus to Chinatown. I wanted to prepare the kids for the arcades and bazaars we would encounter in Hong Kong and there are some great restaurants in Chinatown if you avoid the tourist traps. After walking around to get a feel for the place, amused by the many street vendors and hucksters, we made our way to The House, an asian fusion restaurant on Grant Street. At the time of this writing it was by far the best meal we’ve eaten. I was somewhat apprehensive to take 48-hours out of my life to fly from Florida to Vegas to attend Zumapalooza. It’s only 48-hours right but with our focus on driving revenue and getting new products out the door, 48-hours is a big chunk of time for me. But I was compelled to go because aside from seeing the Zumasys Cloud data center and meeting the team that we’ve entrusted our hosted business initiative too, I also wanted to see what this “Zumasys Culture” was all about. Paul Giobbi their CEO and his team sure talk a lot about it and I was curious as to how it drives business initiatives. They put each of the 400+ attendees up at The Cosmopolitan Resort and Casino, one of the newest properties on the strip. The resort was absolutely top notch, drink prices on the other hand were ridiculous. The view from my room was pretty outstanding. We spent the first day at the Switch InNEVation center, a public / private economic diversification project that bolsters entrepreneurship in Las Vegas. We lobbed questions at the Zumasys guys about intrusion protection, “Ransomware” and disaster recovery. Paul’s keynote along with presentations by key members of his team were given that afternoon. In his presentation he talked about the importance of culture in a company and how it drives business decisions. All talk? Well for starters, Zumasys donates 1% of all revenues (not profits) to charities and the employees decide which non-profits get those funds. In 2012, $200,000 was donated to these charities. The next morning I heard author Shawn Achor talk about “Happiness”. My initial reaction was “Really…we are going to sit through an hour of ra ra feel good speak?” I was pleasantly surprised. Aside from being the best selling author of The Happiness Advantage and enjoying over 7M views on his TED Talk, Shawn provided really concrete advice that he has researched and tested with many Fortune 500 companies on ways that you can truly be happier and more positive without the use of illegal substances. Ok…so this post took longer than 2-minutes to write, but I feel happier. In Jan of 2010, while we were all reeling from the economic downturn and hearing in the news daily about unemployment, food stamps and quantitative easying, Seth Godin wrote a piece about Generosity. I wasn’t prepared to “hear” his message at the time. 2010 was an interesting year for me personally because that’s when I started to blog and dust-off some very rusty technical skills in an effort to build some basic websites. Since then I’ve developed a number of site for both personal, entrepreneurial, and charitable means using WordPress and Buddypress, based on inspiration from The Lean Startup I created a minimally viable mobile web app which eventually become an app for both iOS and Android. I was also able to wrestle my company into one that delivered cash flow positive results right up through Oct of last year when we sold it. Now I am listening and I look forward to contributing my time, energy and mind in things that matter. One of my goals in 2014 is to write more concise and poignant copy. As Robert Peter Clark says, short prose has 3 key elements: focus, wit and polish. A lack of focus can make your writing sloppy, inconsistent and often unnecessarily contradictory. I’ve noticed in just the emails that I’ve written lately that I find myself thinking one thing and writing something else. For instance, I recently sent an email to the CEO of our company saying that “I can’t handle something” followed by “I got it handled”. I am making these careless errors because of a lack of focus. I find myself getting distracted and my mind bounces from one thing to another. Do you ever feel like your thoughts are drifting between emails, instant messages, Evernote, your web browser and calendar reminders? On top of that are phone calls, text messages and interruptions from people. Letting your mind get knocked around by the incoming waves will drown your productivity. Here are three things I’ve started doing lately to help me focus. Only do one thing at a time: I wrote about the myths of multitasking in a previous post. But even though I know you can’t do more than one thing at a time effectively, I still find myself struggling with this in practice. When you write, try to have only one app within view on your desktop. I use multiple virtual desktops on my Macbook Pro. I found that with my 27″ high-res monitor, the downside is being able to put lots of windows on one screen. So when I am writing, I make sure only my writing app is in that desktop. When I am writing an email requiring more than just a few sentences, I will double click it to get it out of the Mail app framework and move it to its own virtual desktop. To access the virtual desktops you must launch Mission Control. You can hit the expose key on your keyboard (see below) or my favorite way is using the 4-finger upward gesture on my Trackpad. Creating a writing space: You need a place that puts you in a productive and creative mood. This isn’t always possible. Sometimes we must be productive on the road, in airplanes or in a noisy or crowded public place. But when possible optimize your effectiveness by creating a private writing place. I have an office in my house with a door I can close that is quiet. While in Key West we visited Ernest Hemingway’s house. Hemingway had a detached study that is apart and away from his main house. While guests and family are carousing in the main house, Hemingway had a place he could go and read, write and think. Use ambient environment apps: The virtual desktops are great and so is quiet or peaceful place. But there are apps available to create your own virtual ambient environment. I use the private writing place app called Ommwriter. Ommwriter takes over your desktop, blocking visibility to all your other apps. It also allows you to chose from various backgrounds and ambient sound tracks to keep you focused on your writing. When the sound of silence becomes defening or tedious, I like to listen to ambient music or a sound generator app. I find that music with a heavy or complex beat wrecks my concentration, but listening to a yoga station on Pandora or Spotify works well. One of my personal favorites is music for programming, a series of mixes intended to aid concentration and increase productivity. If you like the sound of a busy coffee shop to help put you in a productive mood, try Coffitivity. Not my thing but it may be useful for java jocks. Relationships have certainly changed since I was a kid. I remember being in Jr. High and asking a girl if she would “go with me”. Then you would hang out, hold hands and if you dared you would kiss. Since we didn’t have smartphones, texting wasn’t invented but if it existed I am sure we would have used it. Instead we passed notes. We would fold them into these triangle shaped footballs and shoot them over to our new found loved ones. Remember “pen pals”? I never had one, but from what I am told people would write to complete strangers matched up by an intermediary somewhere else in the world. Smartphones, Skype and Instagram has changed all that, theoretically bringing us all closer together. Pen pals have morphed into “text pals”. But are we really closer? Can you have a relationship and not spend much time physically or even face to face with a person? I thought it was impossible until I saw it happen to my 12-year old son. Last summer he met a girl that actually paid attention to him. He saw two girls on a bus during summer camp as they were headed on one of their field trips. The girl he initially talked to gave him the brush off and said something like “what are you looking at”? Her friend smiled at him. He hated going to this summer camp but this one particular girl would laugh at his jokes and was just patient enough to overcome his anti-social youthfulness. After camp they became instant “text pals”. They would stay in constant communication with each other both through private text messages and on Instagram. They shared photos and feelings on what was happening in their separate lives, but in an odd way they were connected. They had a bond that is hard for a forty-something to comprehend. It was nearing summer break again this year and my son was adamant that he was not going to return to this one particular camp. Until he received a text from his text pal about the camp, he agreed to go, they decided upon the date and it was settled. At last, they would once again see each other in person and not merely through an electronic medium. It was Monday night, and my son was texting his friend simple things like “how was your day?”, “so excited about camp”, etc, etc. He would say things like “luv u, as a friend” and she would write back, “LOL ik” (“i know)”. This is how their digital banter would go. Shortly after this exchange my son’s friend had a massive stroke. She was rushed to the hospital where she was moderately stabilized but then sent to a children’s hospital that deals with this type of trauma. She was in a coma, barely hanging on to life. My son found out from my wife and was obviously sad, but hopeful. Lots of banter went back and forth both in text messages and on Instagram about the condition of his friend. Everyone was providing prayers and hope. My son was called out as someone who didn’t know her because he went to a different school and was one year younger. He was somewhat hurt by this but continued to give his support through this digital means of love and affection. My son kept his phone in his room that night hoping to get some news. He texted her saying that if you get this and respond I know you are Ok. She died that night on May 22nd. He found out from a classmate at school the next day. He was devastated. He vacillated between crying intensely to being in deep thought about it, to forgetting about it and being a kid again. Then the cycle would start all over again. He had lots of questions for us; how many people do you know who have died? Did you know any one who died when you were a kid? Tough questions and big emotions to rationalize for a 12-year old. His friend wrote 40 factors about herself on Instagram. One of the things she said is “I don’t know what I want to be when I grow up”. Tonight my son said solemnly that she won’t get the chance to find out. How do you help a child who has lost someone special to them? My mom, who is a psychotherapist, is trained in crisis management. She deals with family crisis situations frequently. She said that one of the first things kids think about is “will this happen to me”? It is so rare for a child to die, especially from a stroke. It is so sudden, so unexpected. Children must be comforted, especially at night and given reassurances that they are Ok. The second thing that helps is having the child express their feelings through art, music and writing. Have them paint or draw a picture depicting a fun experience they had with the person that passed away. If they are capable have them compose a song or write a blog post or poem about memories they have about that person or how they are feeling. Raising a child is hard. Dealing with trauma or emotional stress makes it even harder. For us, dealing with the situation openly and honestly seems to be the best way to handle the it. When you feel like crying cry, if the child wants to talk be ready to listen. But continue to support them and remind them that they will be Ok.